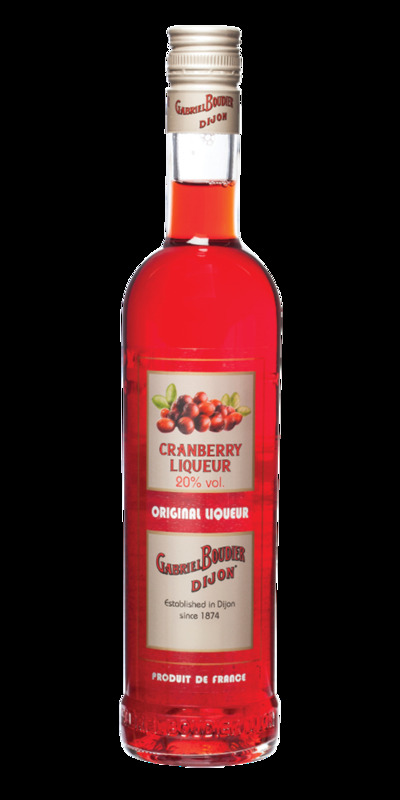 Gabriel Boudier Bartender Cranberry Liqueur | Bartender Liqueurs | Bulk Liqueur — Emporia Brands Ltd. Knowledge and expertise of more than 140 years is at the heart of the House of Gabriel Boudier. A name that is now renowned worldwide. Since its foundation in 1874, Gabriel Boudier has invented and diversified into a range of exceptional products that delight enthusiasts of creme de fruits as well as liqueurs. Gabriel Boudier is now synonymous with authentic tastes which we invite you discover, enjoy and share with us. The Gabriel Boudier Bartender range is par excellence for times of celebration and fun. The name denotes a tend-setter or aficionado, the Bartender range leads the way and keeps you company at sociable and relaxing occasions. With a warm ruby colour, this ‘Diva’ of liqueurs, wakes different sensations on our palate. The nose develops around red berry fruits, and more bitter herbaceous flavours. In the mouth, the acidity of the cranberries is relieved by a light bitterness quite reminiscent of pomegranate. The natural acidity of the cranberries is carefully balanced with a slight addition of sugar. Nose: Strawberry and cranberry fruit with spruce tree and leafy aromas. Palate: Initial sweet strawberry fruit quickly turns to earthy cranberry.